Ned’s Atomic Dustbin took their name from an episode in the classic BBC comedy program The Goon Show. The band’s unique marketing strategy included producing and distributing 86 different t-shirt designs by creating consumer collectables before they even released their first album. The original Ned’s line-up includes Jonn Penney (lead vocals), Alex Griffin (Bass), Matt Cheslin (Bass), Gareth ‘Rat” Pring (Guitar), and Dan Worton (Drums). 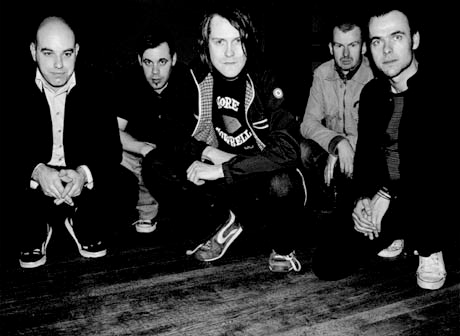 The first two releases generated classic alternative hits such as “Grey Cell Green”, “Kill Your Television”, “Happy”, and “Not Sleeping Around.” The final release was a commercial failure as they tried to fuse techno music into their trademark sound. The band broke up shortly thereafter. The classic line-up reunited in 2008 and have played live sporadically since. Recently Ned’s announced on their website a 25 year anniversary tour called Nedstock 2013 with three November dates scheduled in the UK. Ned’s will be joined by CUD, Republica (remember them… “Ready To Go”) and a DJ set from Fruitbat (Carter USM guitarist). This is setting up nicely for the tour to extend to the States in mid April 2014??? There was a reformation Ned’s act that existed from 2000 – 2008 that shouldn’t be confused with this classic line-up.